Going Wireless? Why Not Go All the Way? Thanks to wireless technology, mobile powered workstations (MPWs) are opening up new frontiers of efficiency and productivity. 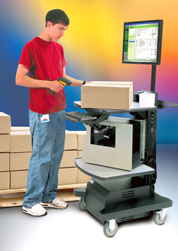 These workstations with integrated power supplies can maneuver computers, printers, scales, barcode scanners, etc., to wherever they are needed. For some facilities, multiple mobile powered workstations can bring about a “system solution” — a whole new way of doing business. Capitalizing on the benefits of auto-ID technologies, they integrate the facility’s software with devices on the workstations to establish mobile on-demand label printing stations, mobile shipping/receiving stations, and so on. Here are three basic ways these workstations or “mobile desks” can help you take full advantage of wireless technology to improve your business.